Important and urgent things should not be ignored: Crises and emergencies. However, the more time you can spend on the non-urgent but important things (prevention, planning, improvement) the less crises and emergencies you will experience.. These are urgent and important things that you should not ignore. However, spending too much time in fire fighting mode will lead to stress and burn out. You will be caught in a never-ending cycle of crisis management. 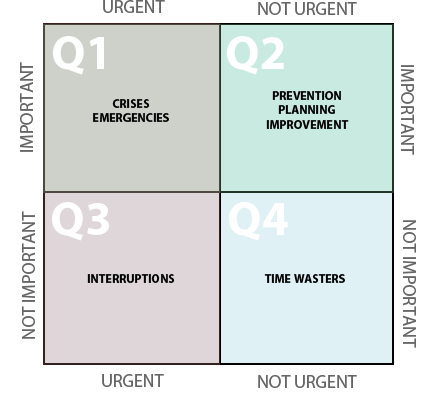 The only way to reduce the time you spend in this quadrant is to be proactive and to spend more time on the important things BEFORE they become emergencies (see Quadrant 2 below). Dealing with a heart attack is an Urgent and Important problem that cannot be ignored (but perhaps by living a healthier lifestyle such health emergencies can be reduced or avoided all together). This is where you should spend most of your time. Spending time on these important things should lead to clear vision and a balanced life, discipline, control, and fewer and fewer crisis situations. 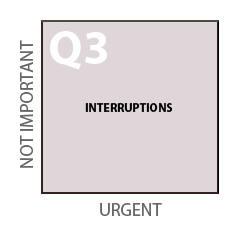 Many of us spend a big portion of our time in this Quadrant confusing the Urgent things for the Important things. Interruptions, ringing phones, most emails, etc… Spending too much time on the unimportant urgent things leads to a very short-term focus with continual crisis management. Your plans and goals will seem increasingly useless since you are unlikely to have time to devote to them. Your relationships and reputation will suffer and you will feel victimized with no control over your life. You have scheduled an important meeting with a coworker 2 weeks ahead of time. This person has very limited time and so you carve out a 30 minute window to deal with a very important matter. As you sit down and start the meeting, your phone rings. The phone is screaming: “Pick me up! Pick me up! Pick me up!”. Most people will pickup the phone and sacrifice the very important meeting for the likely not important but urgent ringing phone. These are the time wasters in your life. How do I use this to make my life better? A. Identify Quadrant 2 activities. 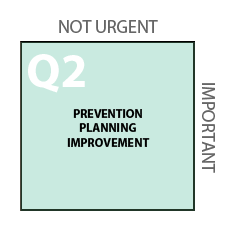 Write down how you can prevent these things from reoccurring or from becoming emergencies in the first place: These are your new Quadrant 2 activities. Look at all the things in Quadrant 4 and STOP DOING THEM! Look at all the things in Quadrant 3 and stop doing them too. This is more difficult as it involves saying NO to people. Schedule time to do Quadrant 2 activities. (Put them in your calendar just like a meeting). DO THE THINGS YOU SCHEDULED! The beauty with spending more time in Quadrant 2 is that it should slowly chip away at all your Quadrant 1 activities. As you reduce your Quadrant 1 activities you have more time for Quadrant 2,, creating a fly-wheel effect. Not quite. The Question “What is important to me?” usually does not have a simple answer. Which quadrant does this fall into? The answer is it depends on YOUR priorities and what is important to YOU. On the surface it looks clearly like a Q4 item – a time waster. Not urgent and certainly not important. But, it could be a Q2 event (important) if you consider the event to be an opportunity to spend quality time building relationships with your parents, children, or friends . Clearly another Q4 item: A time waster. Or is it? If watching TV is a stress reliever for you and serves as a way to wind down and chill out after a hectic day, it could very well be a Q2 activity. Just as long as you frame it correctly and consume it in the right way. To be successful with this method you must have a very clear understanding of what is important to you, what your long term goals are, etc… For more information about how to plan your week around this framework, see my blog post on How I Plan My Week. Brilliant. I assume this is from eisenhower/covey? I was looking for examples of these 4 quadrants to implement them into my business and personal life. Stumbled across this post and it’s been very helpful! Thanks so much for this informative post. This is one of the very best discussions of the 4 quadrants I’ve seen. Great service to anyone looking to convey what this means to someone else and how to apply it. Brilliant Job bro. So helpful. I got to be in q2 and I realised this after spending my entire life in q1 and wondering what the hell is wrong with me. I read all the self help books in my life and none of them explained this to me in such simple terms. This is very helpful – really nice job on this post. Nice holistic presentation of the quadrants–usually people think of these as pertaining only to their professional lives but thre idea runs across everything we do…thanks!